Some food just has nostalgia. For me, Hamburger Helper, for better or worse, is one of them. Back before I knew better, I thought I was eating a healthy meal by mixing a can of green beans into some Hamburger Helper on the stove. Years ago, I ate this often with an elderly neighbor that lived down the street, a dear friend whom I greatly miss. Food is very powerful. It is an integral part of so many memories and traditions. And that makes some foods very difficult to give up. I don’t believe any of us should give up foods that we want to continue eating. We simply need to discover better ways of preparing them so we can both nourish our bodies and thoroughly enjoy the foods that we want. For me, one food I want is Hamburger Helper. I like the familiarity of it. I enjoy having my food all cooked together in one large pot. I love foods with flavorful sauces. But, I do not want to eat a meal that does not nourish my body. I do not want to eat a meal that is loaded with sodium, artificial flavoring, and preservatives. I do not want to eat a meal full of refined grains that will cause a fast sugar rise followed by a crash. I do not want to eat meat from animals raised in unethical conditions and given antibiotics and hormones. These are conflicting desires, but fortunately, there is a solution. I can still eat Hamburger Helper. But, it will be my own recipe that I make myself. Sorry, Betty Crocker! Your food does not properly nourish my body and, frankly, my food tastes much better. 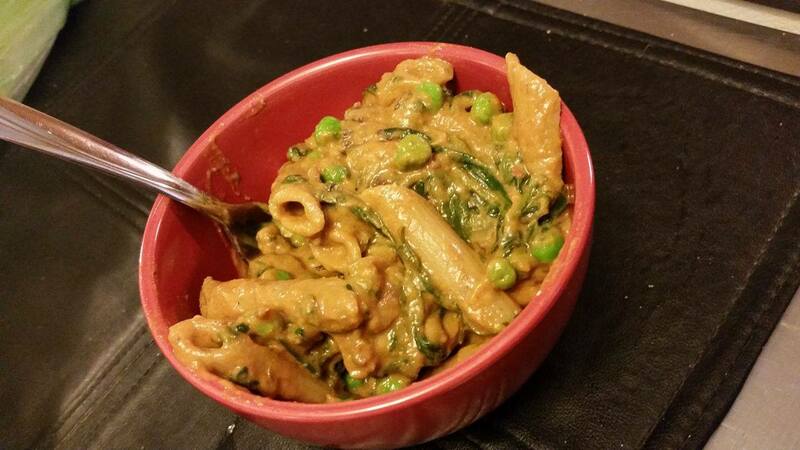 This recipe is dairy free because I share it with my son, and he does not tolerate cow milk. Being that cheesy types of Hamburger Helper are my favorite, I found a food that creates a creamy, cheesy tasting sauce without the use of cheese: nutritional yeast. Nutritional yeast is a delightful cheese replacement with an impressive amino acid profile (for a non-animal sourced food). You can find it online or at a variety of health food stores. If you absolutely want real cheese in this recipe, omit the nutritional yeast and stir in 1-2 cups of cheddar cheese at the very end. But, I strongly encourage you to step outside the box, add more variety to your dietary repertoire, and give the nutritional yeast a try. I typically use ground goat meat in recipes that call for ground red meat because it is very lean, but, in this instance, I went with good ol’ ground beef. It’s Hamburger Helper, after all, not Goatburger Helper. The ground beef I used in this recipe was from cows that were 100% pasture raised and grass fed, yielding a much tastier, healthier beef. While you can use pre-made beef broth, you will be missing out on the many benefits (in both taste and nourishment) of real bone broth. I will post all about broth at another time, though there are plenty of sources online to teach you how. I make very large batches at once and freeze it into portions to have on hand for the months to come. Give it a try! 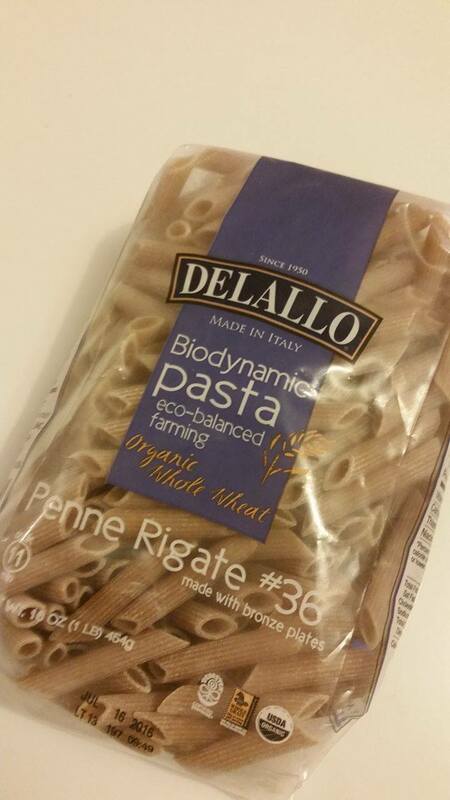 I love Dellalo Biodynamic Pasta. It has multiple whole grains, no artificial ingredients, and comes from environmentally friendly farming practices. And, best of all, it tastes great! I watch for it to go on sale and buy a large quantity. 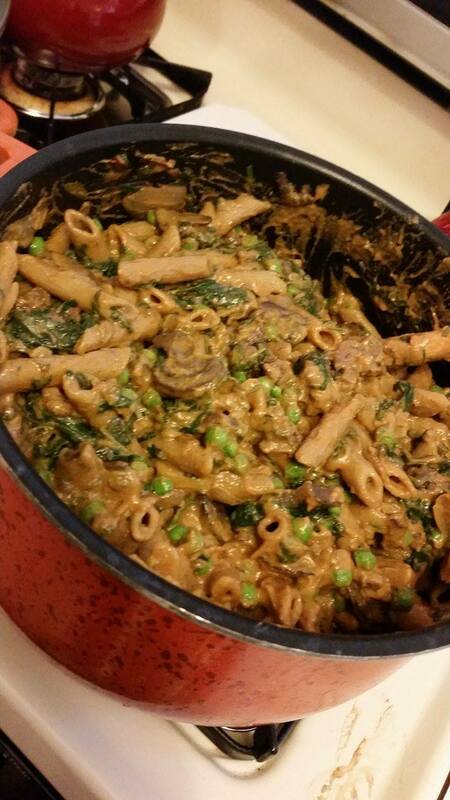 And with that, here is my dairy free, homemade Hamburger Helper recipe. It requires multiple steps, but bear in mind these steps are mostly done simultaneously, so this is not a time consuming process. It includes a foundation of whole grains and vegetables and is fantastically delicious. Add 2 Tbsp olive oil to a large skillet and heat over medium low heat. Add the eggplant rounds and red pepper and saute for 10 minutes, turning the eggplant half way through. 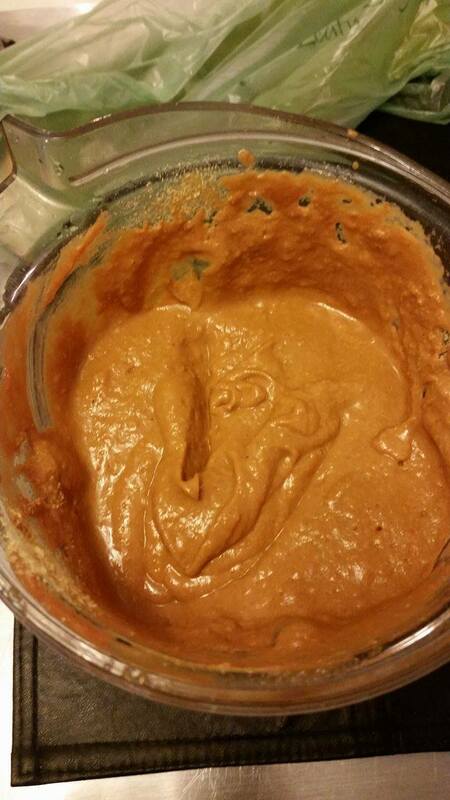 Once cooled, transfer to a blender along with the other sauce ingredients. Puree the sauce in the blender and set aside. Add 2 more Tbsp olive oil to the skillet and add the onion, mushrooms, and baby spinach. You will likely need to add the spinach in batches as it will decrease in volume greatly upon cooking. Warm the green peas according to package directions. Meanwhile, add the ground beef to a skillet to brown, and boil the pasta in a large pot according to package directions. Drain the beef and the pasta and stir together in the large pot along with the sauteed vegetables and green peas. Stir in the sauce. That’s it! There will be plenty of leftovers! *If you have an oral eating kiddo that tends to pick out his/her veggies during a meal rather than eat them, throw some or all of the veggie mixure into the blender and give it a good whirl before stirring them into the pot. This recipe makes 20 servings of 1 cup, so it makes a very large batch. It’s not a bad idea to make a double batch of the sauce and veggies and freeze the extra. Next time you make this dish (and I promise, you will want to! ), all you need to do is cook up some hamburger and pasta and stir in the rest for a quick meal. A 1 cup serving contains 235 calories, 14g protein, 27 carbs, 6g fiber, 6g fat, 47mg calcium, and 3mg iron. 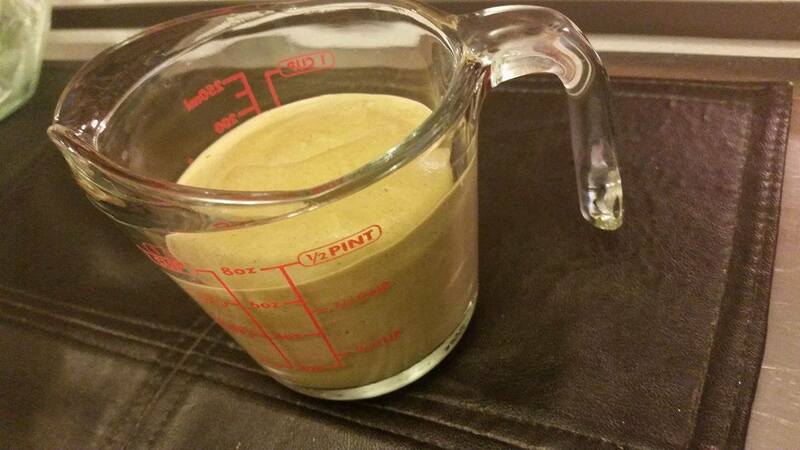 I blended a half cup serving with some goat milk and cabbage for a low volume, nourishing meal. Enjoy! Hi Leslie! It’s Sandra H. I love your blog! Thanks for sharing it with me! I’m forwarding it to the dietician I work with a La Rabida Children’s Hospital!